Don’t be fooled by other magazines with similar names purporting to objectively analyze and recommend products. There is only one Consumer Reports. They do not except any advertising and therefore are not beholden to any corporation. They even go beyond this and will not allow a retailer or manufacturer to use the name Consumer Reports in their advertising. Even if Consumer Reports gives a product a great rating, that company cannot mention this in their advertising. If they do, they get sued by Consumer Reports. No other company goes this far and is this “squeaky clean”. J.D. Powers is a company that ranks and compares lots of products including cars, but they allow companies to use the JD Power name to advertise their products when they rated them good. You can understand why a consumer might be just a little more skeptical of J. D. Powers’ objectivity than Consumer Reports’. I am not saying that Consumer Reports is infallible. They do make mistakes and they have been successfully sued by some companies that were affected by their mistakes in testing. But this is very rare. As a car dealer for over forty years, I have not always liked what I read about all of the makes and models of cars I have sold, but I grudgingly had to admit that the reports were almost always accurate. I have to confess that with some make and model cars I have sold over the years, I was very thankful that the circulation of Consumer Reports is not very large. Their circulation is growing as consumers become more educated and sophisticated. It’s not as easy as it once was to sell a Yugo to most consumers. This annual auto issue which is on the newsstands now should be a mandatory read before you buy your next used or new car. Here are some of the articles in this issue…Top Picks (the best new vehicles they have tested), Best and Worst (tells you the ones you definitely shouldn’t buy), Coming for 2008, Who Make The Best Cars (best manufacturers), Buy Better on the Web (The Internet is the best place to buy your next car), Reliability trends (repair histories on all makes and models), What’s Next in Auto Safety, and Used Cars, Best and Worst. This is my letter in reply to Al Sammartino’s letter to the editor of the Home Town News questioning the accuracy of my recent column, “Don’t Pay for Nitrogen in Your Tires” which ran in the March 2nd newspaper. Thanks for your letter which raises some good questions. I will address the specific points made by you, but rather than turn this into a boring scientific, academic debate, I also have an interesting proposal for you. You and I will each fork over $10,000 to be held in escrow by an independent third party. We will select an impartial, qualified tester of tires like the American Automobile Association or the New England Technical Institute. We will ask this organization, using scientific method, to determine whether or not nitrogen filled tires cause a car to get better gas mileage and longer tire wear than tires filled with air. If the results are that nitrogen filled tires are proven to give statistically significant better gas mileage and wear, my escrow check will be donated to your favorite charity. If not, my favorite charity is the Salvation Army. Please call me on my cell phone, 561 358-1474 so that we can get started. It’s a win-win. Money goes to charity either way and one of us is going to learn something he didn’t know. Before I address the points you made in your letter, I think it is only fair that the readers of my column and your letter know that you and I have met before. I was surprised that you didn’t mention that in your letter. I know that you will recall that the company owned by you, Coastal Automotive Equipment Sales, Inc. was an unsuccessful bidder three years ago when I was buying $250,000 worth of hydraulic lifts for my new service department. I only mention this in the interests of complete disclosure to our readers. The first point I will address are your words “I’m not sure where Earl got his pricing”. This refers to my statement that car dealers were charging as much as $199 for nitrogen in four tires. I am enclosing a picture of a price sticker showing a $199 price from a dealer who may well be one of your nitrogen customers. Some of your statements about nitrogen are accurate. Nitrogen does expand less than air, very slightly less. The coeffient of expansion of nitrogen is about 20% less than that of air, but, of course air is 78% nitrogen. It is also true that filling a tire with nitrogen will reduce the amount of humidity inside the tire. Nitrogen molecules are larger than Oxygen molecules and will take longer to permeate the tire wall, but, as you know, 78% of air is already made of nitrogen. What all of your points citing the superiority of nitrogen don’t mention is that because air is already mainly nitrogen, the differences are so slight they can’t even be measured. As I said in my column, I tested tires nitrogen and with air in my rental fleet for many weeks and there was no measurable difference in inflation. A good analogy to using nitrogen in your tires is those Olympic swimmers that shave their entire body with the hope of cutting off one one-hundredth of a second in a 200 meter race. I can see why NASCAR uses nitrogen in tires. Their cars run over 200 mph at extremely high temperatures and winners are measured in hundredths of seconds. A lot of people put nitrogen in their tires because they like to believe it helps, but I challenge anybody to show me a valid, scientific, independent study that proves nitrogen improves gas mileage or tire wear. I don’t have a problem with you selling nitrogen to someone for a low price. My wife and I take a lot of vitamins and herbs that have never been proven to improve our health by medical science, but we are careful not to take any that can be harmful. We look at it this way. It might help, it can’t hurt, and the vitamins are cheap. 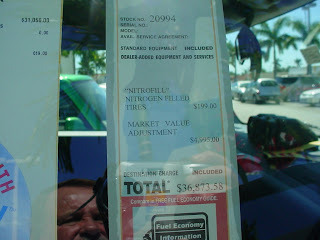 The only thing that nitrogen can harm is the pocket book of the buyer and $199 for four tires filled with a gas that has never been proven to help gas mileage or tire wear is insane. (1) Choose the dealer with the best service department. Remember that you don’t have to have the same dealership service your car that sold you your car. You probably bought your car from the dealer who gave you the best price. You should have your car serviced at the dealer who can best maintain and repair your car. The price of service is important, but secondary to the quality of the service and repairs. Do a little research. Ask friends and neighbors who drive your make of car. Check with the BBB and the County Office of Consumer Affairs. Ask the service manager at the dealership to show you his factory score on CSI (customer satisfaction index). Every manufacturer surveys dealers’ service customers and ranks that dealer by how well he treats his customers. (2) Establish a personal relationship with your service advisor. The person in the service drive who writes up your repair order is very important. Be sure you get a good one. He should be knowledgeable, attentive to your needs, promptly return phone calls, and recommend only necessary services. You might not find this person on your first visit, but if you aren’t comfortable with the person you are dealing with, ask for one with whom you are. When you make an appointment to have your car serviced, always ask for that service advisor. (3) Don’t pay the “gotcha”, miscellaneous supplies fee. Almost all car dealers tack on a phony fee when you pay your bill which is simply more profit to the dealer, but is disguised by various labels. It is also sometimes called “environmental impact fee”, “sundry shop supplies” and many others. The cashier just adds a percentage ranging from 5% to 10% to your bill. This is no different than the “dealer fee” that the sales department tacked on to the price they quoted you on the price of the car. Most dealers will waive this fee if you complain about it, especially if you threaten to call the BBB, their manufacturer, or the Florida Attorney General’s office. (4) Always road test your car, preferably with the technician. If you brought your car in for a drivability problem such as a noise, vibration, or pulling to the right or left, don’t accept the car back until you ride in the car with the technician or service advisor and confirm that the problem has been remedied. I also recommend that you drive the car with the service advisor to demonstrate the problem when you bring it in. Experiencing what you experience always communicates your problem more accurately than listening to your description of the problem. (5) Ask for a written estimate of the total cost of repairs and maintenance. Florida law requires that the dealer give you a written estimate. By law, they may not exceed this by more than 10%. (6) Make an appointment ahead of time. You should insist on making an appointment and you should try to make that appointment at a time when the dealer’s service department will be least busy…typically the middle of the afternoon on weekdays or Saturday and Sunday. Avoid the 7:30-8:00 morning rush. When your service advisor has written up your repair order, ask him how long it will take. After he tells you, ask him to let you know ahead of time if, for any unforeseen reason, your car will not be ready in the promised time. Often times when you call a service department they will tell you to “bring the car in anytime” or “come right over”. Service advisors will tell you this because they are either too busy or too lazy to take the time to make a proper appointment. When they tell you this, tell them that your time is very valuable and that you insist on an appointment at a time when they can get you in and out quickly. Always write down the name of the person that gave you the appointment. (7) Shop and compare high cost repair prices. Most service departments are competitive on maintenance items like oil changes, wheel alignments, and tire rotations. However, the costs of major repairs can vary considerably. If you are looking at an air-conditoner, transmission, or engine repair that can cost several thousands of dollars, get bids from more than one service department. Often just suggesting that you will do this will keep the cost down from the dealership you prefer. (8) Introduce yourself to the service manager. This falls along the same philosophy as developing a good personal relationship with your service advisor. It can’t hurt to know the “boss”. If you are on first name basis with the service manager, it just might earn you a slightly higher level of treatment from those that work for him. You may have read my columns denouncing the “dealer fee” which is a charge car dealers add to the price they have already quoted you on the car. They refer to it as a fee to fool you into thinking it’s a legitimate fee like sales tax or a license fee. What it is, is profit to the dealer. That’s exactly what banks and leasing companies do when they lease you a car. They most commonly label their “fee” the “lease acquisition fee”, but all it is is profit to the bank or leasing company, and in some cases a smaller portion is kicked back to the car dealer. This fee is also called by different names like “administrative fee”. Yesterday I got a complaint letter from a customer in North Palm Beach who was a reader of this column. He had just discovered that he had paid an $895 “lease acquisition fee” when he leased his new Toyota from my dealership. I called him, apologized, and told him that I agreed with him that this was not the right thing for banks to do, but that they all did it. I also agreed with him that the “lease acquisition fee” should be disclosed and explained on the lease contract. It should be called “profit to the bank” and in cases where the dealer gets a portion of this fee, “profit to the bank and dealer”. When a car dealer sells you a car, you expect him to make his profit by adding a markup to the wholesale price he paid the manufacturer. You expect and understand this. Therefore you can shop and compare prices between different dealerships. You expect a bank or a leasing company to make their lease profit by marking up the cost of their money during the time you drive their car. On a lease, it’s called a lease factor and on a purchase it’s called an interest rate. The bank owns the car because they bought if from the dealer. If you drive their car for 36 months, your monthly payments must cover their costs of depreciation, money, overhead and also pay them a profit. You expect and understand this. Therefore you can shop and compare lease factors and residuals. The residual establishes the cost of depreciation and the lease factor establishes the cost of money. The mark up over these two costs should be the profit to the bank. The “lease acquisition fee” does not appear on the contract. It is disclosed on a separate form which includes everything in the “capitalized cost” of the car you are leasing. Most people understandably think that the capitalized cost of the car is just for the car, not some extra profit for the bank. I don’t know any bank or leasing company that does not charge a lease acquisition fee. This fact is often used to legitimize it. When a customer does object, the answer is “all banks charge this fee”. That doesn’t make it right! That’s the same explanation that car dealers give when they get caught charging their “dealer fee”. Just because almost everybody does something does not make it right. These fees vary over about the same range as dealer fees…from about $495 up to about $895. Oh, there are some other fees that the banks and leasing companies charge you when you lease a car that you probably didn’t know about when you signed in. If you buy your car at the end of the lease, there is a “purchase option fee”. If you don’t buy it there is a “lease disposal fee”. These vary from $150 to $450. The bank knew in advanced that you were either going to buy the car or not buy the car at the end of the lease. Their efforts associated with your choice are simply the overhead cost of operating a leasing company and should be built into their rates. When you quote your customers a price and then increase the price after the purchase or lease where will it stop. How about a “fuel adjustment fee” because of rising gasoline prices or a “power fee” to help the banks pay their light bills? Pricing of products should be transparent, up front, and not convoluted so that the consumer can easily shop and compare. Costs of doing business should be included in the pricing of products, not tacked on after the price is quoted and/or the contract is signed. Of course, that’s exactly why banks and car dealers have obscure fees like this, so you can’t easily shop and compare. Right now there isn’t much you can do about the lease acquisition fee except voice your opinion to your bank and your congressman. I am learning as I approach 70 that I’m not quite as sharp in some areas as I once was. My memory is not as good and I am not as fast as I used to be. This is not to say that I am not as smart as I was when I was younger. In fact, I’m a lot smarter. There was a great article in the February 16 Wall Street Journal entitled “The Upside of Aging”. It explained how recent scientific studies have proven that even though certain mental abilities like memory and reaction times regress as we age, other more important mental abilities like judgment, empathy, vocabulary, and semantic memory more than offset the negatives. Semantic memory is the recollection of facts and figures from your field of endeavor or hobby and is most robust in seniors. If you would like to read this article, send me your email address or fax number and I will send it to you.